The 2018 Ford Aspire or Figo Aspire is expected to be launched in India on October 4, and will come with cosmetic updates, new features and possibly a CNG variant as well. 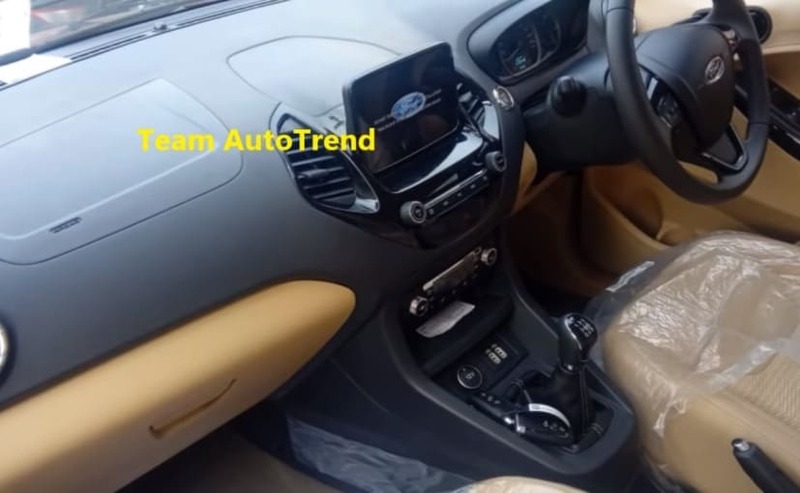 Images of the soon-to-be-launched Ford Aspire facelift have recently surfaced only revealing the updated car in its entirety. The new leaked images give us a closer look at the visual updates made to the car in and out, and there certainly some considerable ones. 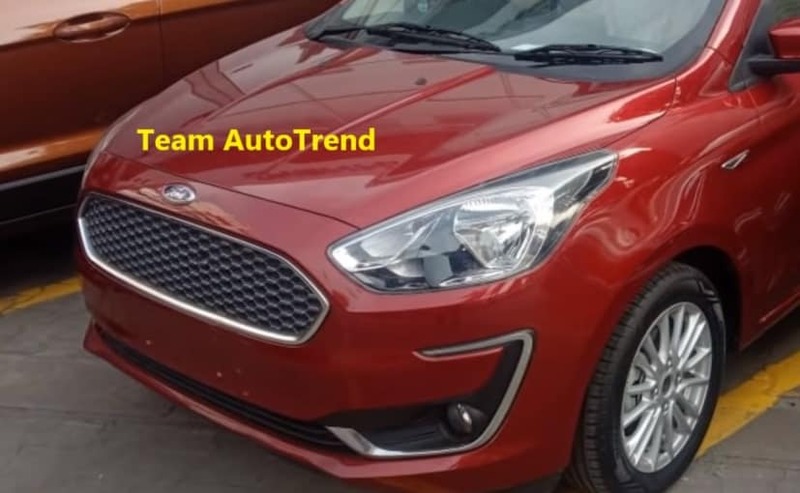 The cars in the images appear to be the top-end Titanium+ variants, and interestingly enough, both come with the 'Figo Aspire' badging, which indicates that Ford is likely to use the Figo name in the prefix again. 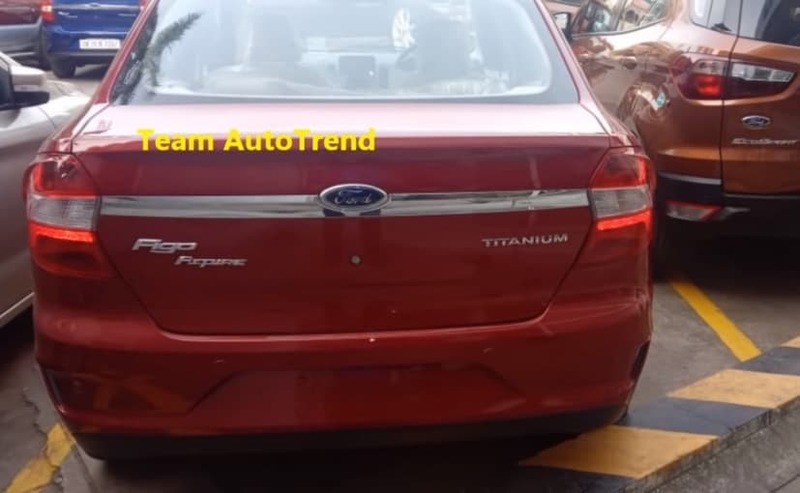 Going by the images, the facelifted Ford Aspire will look identical to the Ford Figo Sedan, which is exported to South Africa from the company Chennai plant. The basic design of the car remains unchanged, and so does most of the exterior panels and equipment. 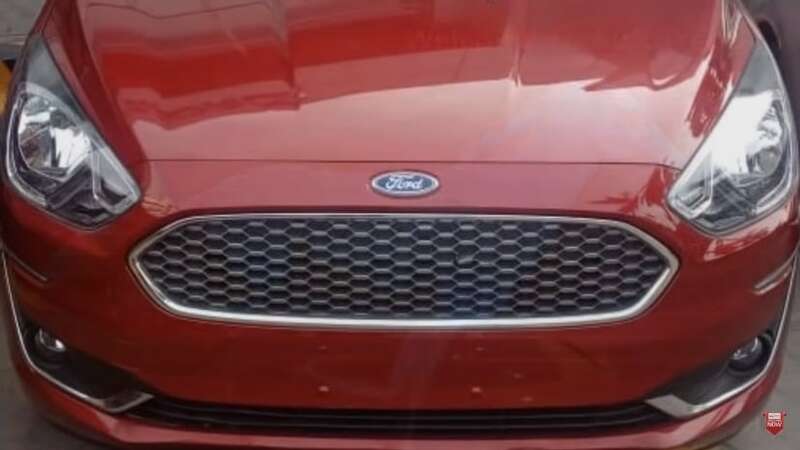 Based on these and some earlier seen spy images, its confirmed that the 2018 Ford Aspire will comes with a new honey-comb pattern chrome grille with an all-new bumper design, with sleek C-shaped chrome elements on either end with new round foglamps and a wider central airdam. The headlamps look similar to the outgoing one, but we do see a new cluster design and possibly the addition of LED daytime running lamps. Towards the sides, the car is almost identical to the outgoing Ford Aspire, with the only mentionable difference being the new alloys wheels. Moving towards the rear we see a pair of revised taillamps with a thick chrome slat on the boot lid, connecting the two light units. Also, considering only one of these two cars come with the diesel engine indicative TDCI badging, the other one could be a petrol option. 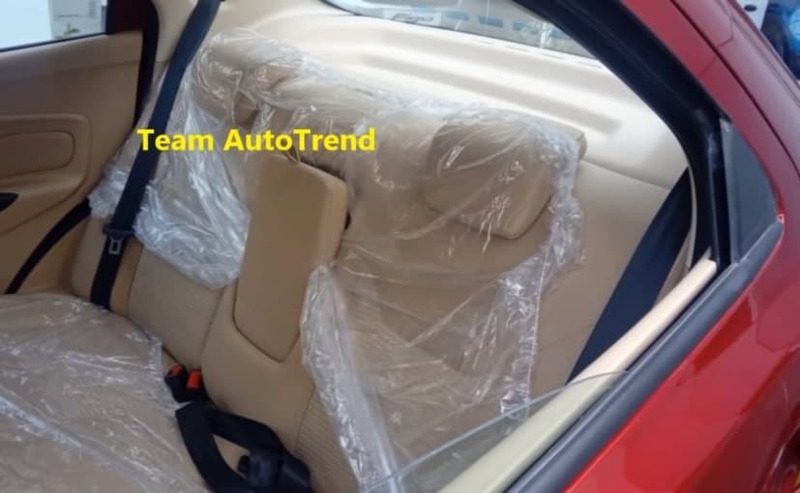 We see more updates made to the cabin, which now comes with a heavily updated dashboard that gets dual tone black and beige treatment, while the upholstery and rest of the cabin is largely covered in beige interior. The car now features a new dashtop touchscreen infotainment with minimal button controls and redesigned centre air-con vents on either side. The rest of the bits like the centre console, side air-con vents, steering wheel and the instrument cluster remain similar to the existing model. 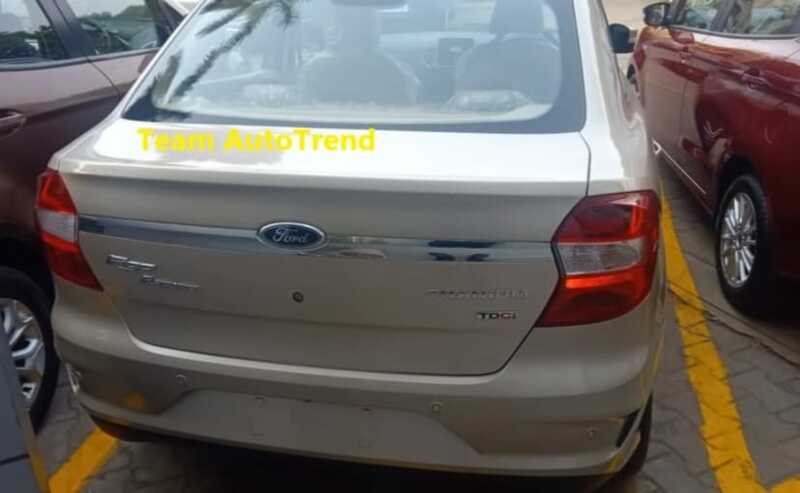 The final technical specs are still not confirmed, but based on some information we received from a couple of dealers, the updated Ford Aspire will for the first time come in a CNG kit paired with the existing 1.2-litre petrol engine, possibly to cater to the fleet taxi market. In fact, a CNG test mule of the facelifted Figo hatchback has also been spotted a few months ago. The diesel version will continue to get the tried and tested 1.5-litre TDCI oil burner mated to a 5-speed manual gearbox as standard, while we also expect ford to offer the new 1.2-litre, three-cylinder petrol engine from the Dragon series, which could come mated to a 5-speed manual and possibly an automatic transmission. The 2018 Ford Aspire or Figo Aspire is expected to be launched in India on October 4, and it will continue to rivals the likes of Maruti Suzuki Dzire, Honda Amaze, Hyundai Xcent and Volkswagen Ameo.